Trust me when I say this, a spyware on your computer can destroy your social, private, and public life in minutes. Well, I know this because I have been in this industry since I was 13 years old, and spyware, keyloggers were my points of interest. But pretty recently I came across a platform, and it took me by interest because it was something I was already interested in. I will make this easier for you, covert pro is an application that claims it can protect you from spyware. 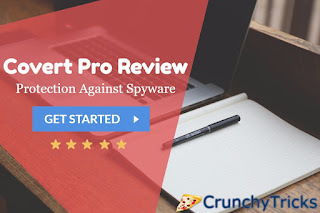 Of course, if I am writing this review on Covert Pro for Windows I need to explain to you what are spyware, right? Well, spywares are small software, applications, Hidden and bound inside other programs, images, video files that are executed as soon as you click on the files. It is like I can hide a spyware inside a picture, so when you click on the picture to wear it the spyware will get installed in the background on your computer. Well after that it's an easy road, I mean I will be getting all your clicks, keyboard activities, emails, credit card reports and what not. It just doesn't end there, I might even be able to get a snapshot of your screen every time you "click", so just imagine how much of data is at risk here! What You'll be Getting with Covert Pro? Well, first of all, don't confuse Covert Pro, with Covert Pro USB. They both have a lot in common, and yet a lot of differences. Covert Pro is something that would protect your one computer from threats while Covert Pro USB can be installed on a thumb drive and can be carried away with you, and it can start protecting any computer it's attached to. So well, we are getting you a sneak-peek into Covert Pro, and not Covert Pro USB. So let's take a deeper look into what you're getting with Covert Pro! Covert Pro is a "masking" application, an application, inside which you can run applications, analyze, monitor and do lots of other stuff. And it's protective walls can't be breached by Spywares, so yeah that's what it is. Well in order for the SpyWare to send information to the attacker, it needs to be connected to the internet, right? 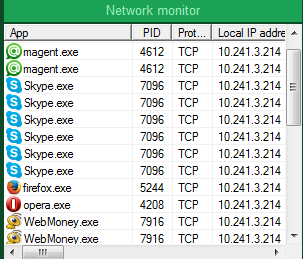 Now that's where it gets killed, Covert Pro's network monitor gives you a full list of whatever applications have access to the internet at the moment, and anything looks suspicious? Well, it gets killed by you simple huh? 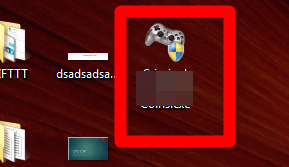 Spywares are mostly (read always) hidden (of course!) right? I mean the attacker won't just be like:- "Hey Man how are you? Here I am please kill me", right? And well, you can detect them with your naked eye(meaning without special operations or platforms, platforms like Covert-Pro) So yeah that's what covert pro does for you. 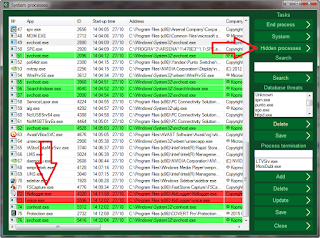 It has a special option to show all the hidden programs to you, well not all of them are spyware. Most are important functions for the system, but it shows you those programs too which shouldn't be there, so well just kill them. You definitely don't want your personal video and voice calls to be interpreted by some third party guy right? I know this sounds rather insane but, yeah you voice calls get tapped too, and that's exactly what Covert Ops doesn't let happen. It has this neatly crafted option of disabling and using the microphones and speakers within a secure platform, from where the spyware won't really be of any use. So yeah if you frequently are on voice calls over your computer, this is yet another reason for you to go with it. Well, not everything that's running is harmful, right? So well Covert-Pro got as many as three different protection modes for you so that you can run the programs within a protected mode and still not be attacked! It lets you control all the running applications inside the secure platform, well this is just one of their best tweaks to optimize user experience. There's nothing you "should do but can't do" with Covert Pro! It has been classified as "Mode 0", "Mode 1" & "Mode 2" so see? No technical terms there, nothing that requires a PhD in anything, just protection, pure protection! Languages, A lot of them! Yeah, with Covert Ops, you don't have to stress yourself out if you're not an English speaker. Because their team knows it well that attackers don't attack people who don't speak English, right? So yeah, Covert Pro is loaded with as many as four most commonly spoken languages around the globe. So yeah, if you're any guy who needs protection, or just doesn't feel secure about his system, well then Covert Pro has got it covered! Yeah, this is their latest addition and something you can't afford to miss if you're the least bit serious about your system security. Well yeah, that's exactly what the secure messenger from Covert Pro makes possible! You still got excuses for not securing yourself? So yeah, their super advanced Encryption system lets you chat with your users without worrying a lot about the security because all the messages pass via a pretty advanced encryption system. So you have a private Encryption key, and your receiver has to be aware of what it is. That way, only those people who are really supposed to be getting the messages, get them. And all of this happens within a secure environment, so no way the spyware thing can get on you. No, don't bother yourself with the technicalities, just know this:- It has literally revolutionized security and encryption just about totally. Just to give you a mist-free picture, I created a spyware myself and tested it out on Covert-Pro so that you know this thing works. Now that it’s running, I just head over to System Processes in Covert pro, and it shows me the “possible” threats in a highlighted fashion. I just find the process that’s not familiar to me and click on End Processes. See? The lifespan of the spyware is ended! Wasn’t too hard was it? The above features aren't even a glimpse of what the Full version of Covert Pro for windows is capable of ! Excited already? Go along and grab it right now! Well, the features I mentioned were the most popular, and attention-grabbing ones. Let me assure you, Cover pro has over 30+ such features and it's not literally possible for me to explain their "superpowers" in one single post. You can download covert pro trial version, if you're not willing to pay at first. So, what are you waiting for? Wondering if it's "worth" wasting your one month's coffee budget on Security? Just one way to find out, right? Go Grab it!